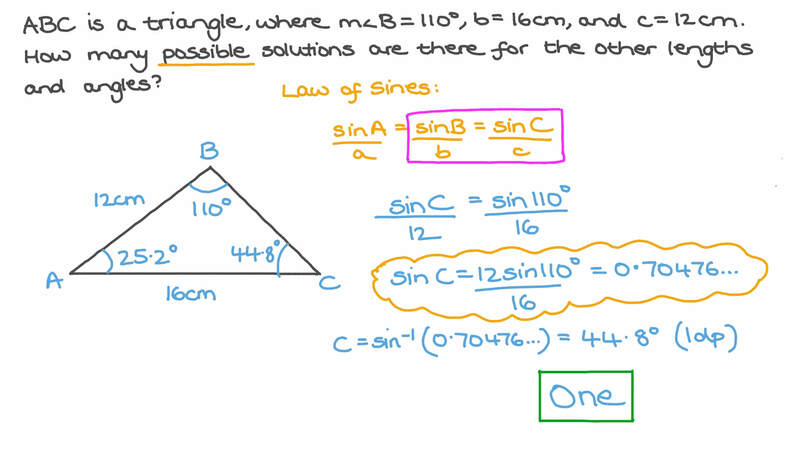 In this lesson, we will learn how to use the rule of sines to solve SSA (side-side-angle) ambiguous triangles. 𝐴 𝐵 𝐶 is a triangle, where 𝑚 ∠ 𝐵 = 1 1 0 ∘ , 𝑏 = 1 6 cm, and 𝑐 = 1 2 cm. How many possible solutions are there for the other lengths and angles? 𝐴 𝐵 𝐶 is a triangle where 𝑎 = 1 3 . 8 c m , 𝑏 = 1 5 . 9 c m and 𝑚 ∠ 𝐴 = 2 8 ∘ . Find all possible values for the other lengths and angles giving lengths to two decimal places and angles to the nearest second. is a triangle, where , , and . If the triangle exists, find all the possible values for the other lengths and angles giving the lengths to two decimal places and angles to the nearest second. is a triangle, where , , and . If the triangle exists, find all the possible values for the other lengths and angles in , giving the lengths to two decimal places and angles to the nearest degree. BThe triangle does not exist. For the given figure, 𝐴 𝐵 = 1 1 , 𝐵 𝐶 = 9 , and 𝑚 ∠ 𝐵 𝐴 𝐶 = 4 1 ∘ . Use the law of sines to work out the size of ∠ 𝐴 𝐶 𝐵 . Give your answer to two decimal places. 𝐴 𝐵 𝐶 is a triangle, where 𝑚 ∠ 𝐴 = 7 0 ∘ , 𝐵 𝐶 = 3 c m , and 𝐴 𝐶 = 3 9 c m . If the triangle exists, find all the possible values for the other lengths and angles in △ 𝐴 𝐵 𝐶 giving the lengths to two decimal places and angles to the nearest degree. 𝐴 𝐵 𝐶 is a triangle where 𝑚 ∠ 𝐴 = 4 0 ∘ , 𝑎 = 5 c m and 𝑏 = 4 c m . If the triangle exists, find all the possible values for the other lengths and angles in 𝐴 𝐵 𝐶 giving lengths to two decimal places and angles to the nearest second. 𝐴 𝐵 𝐶 is a triangle, where 𝑎 = 2 8 c m , 𝑏 = 1 7 c m , and 𝑚 ∠ 𝐶 = 6 0 ∘ . Find the missing length rounded to three decimal places and the missing angles rounded to the nearest degree. 𝐴 𝐵 𝐶 is a triangle, where 𝑚 ∠ 𝐵 = 7 0 ∘ , 𝑏 = 3 cm, and 𝑐 = 6 cm. How many possible solutions are there for the other lengths and angles? 𝐴 𝐵 𝐶 is a triangle, where 𝑚 ∠ 𝐵 = 1 3 0 ∘ , 𝑏 = 1 7 cm, and 𝑐 = 3 cm. How many possible solutions are there for the other lengths and angles?